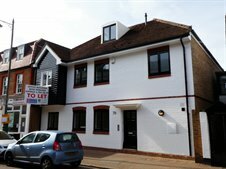 Cattaneo Commercial have just concluded the sale of Albemarle House, 79 High Street, Thames Ditton, Surrey KT7 0DF. This 3 storey office building, built in the late 1980's, comprises 2,722 sq ft and was part of the redevelopment of the old AC Cars factory. Thames Ditton is an affluent village situated by the River Thames and approximately 1 mile from Hampton Court. We are experiencing strong demand for all types of commercial property and if you are considering selling your property please contact Andy Armiger on 020 8546 2166.